Fly with Bespoke Air Charter to Ibiza, one of the Balearic islands, rich with culture and home to some of the most exquisite beaches the Mediterranean has to offer. Experience all the excitement and beauty of Ibiza, and revel in the many bays, coves and steep rocks that ascend from the crystalline waters. 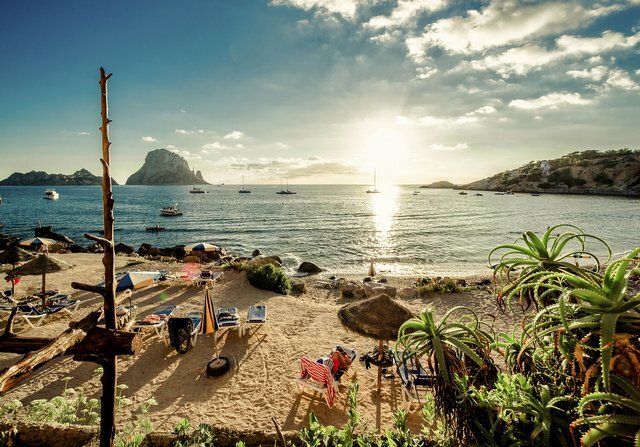 As you relax on your chartered jet flying through the sun-drenched sky and get your first glimpse of this enchanting island, you will instantly fall in love with the all-consuming magic that is Ibiza. The twinkling lights that illuminate this gorgeous island create an enchanting ambience, which seems to perforate the rolling ocean waves. Let the soft warmth of the late evening sun cascade down your body, as the ocean’s salty scent fills your nose. Let yourself drift slowly along the clear, white sand beaches that the Mediterranean coastline offers, as the cool waves lap over your weary feet. An uninhabited nature reserve, east of the island, holds Isla Es Vedra, and a number of other smaller islands. Es Vedra is the key to many a myth, legend and local tale. At 413 metres high, Es Vedra pierces through the azure waters, and can be viewed from afar. This mystical island is renowned for being home to the sirens and sea-nymphs that enticed Odysseus from his ship, in Homer’s Odyssey. As well as the legends that surround this rocky turmoil, it is also known for it’s utterly magnificent sunset. Es Vedra is authentic, untainted and heavenly. Surrounded by a deep, flaming halo of passionate amber, Es Vedra stands proudly, unyielding to the aquamarine depths beneath. Ibiza is known for its raucous good fun, and exceptional nightlife. If you are looking to get down and dirty in amongst Ibiza’s elite clubbers, head to Pacha, Amnesia or Space, all situated in Ibiza town. These are the three most well known clubs and are intrinsic to Ibiza’s popular nightlife. Pacha is a nightclub franchise, with the headquarters located in Ibiza. It is one of the most glamorous nightclubs, and has been home to some of the largest parties of the last thirty years. It has hosted many world remowned DJs and producers that have shaped the dance music scene, and has been enjoyed by millions of clubbers from all over the world! Famous faces have been spotted in Pacha, and you too can enjoy the splendour of the VIP section, as it accessible to all; it can result in a cheaper, less hectic, experience than that of the packed dance floor. If partying isn’t your cup of tea, then we suggest heading to the Ibiza countryside to Tekne. Tekne is a fitness retreat that caters to everyone. If you have children, but want to have some ‘me time’, look no further than Tekne Fitness. Open to all levels, you can indulge in a variety of retreats, ranging from gymnastics, detox, and body blast to the family option. Kids have their own coach and can choose from many activities, such as nature walks, pool games and gymnastics! Whilst the kids are occupied having an energy-fuelled time, the parents get to have an equally exhilarating experience. There is also the option of family fun days, where the whole family can engage in invigorating activities together. Whether, it’s Orlando Bloom jetting across to the celebrity party capital, or Beyoncé and Jay-Z touching down in a private helicopter for a stylish, tan top up, a celebrity sighting is almost guaranteed on your glamorous island break. Even former labour leader Ed Miliband and his wife visited Ibiza. Anyone who is anyone spends his or her summer in Ibiza!